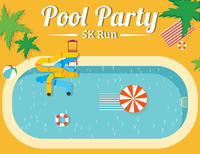 Beat the heat with the Pool Party 5k Run/Walk & Kids 1K! The party takes place on SATURDAY, June 23, 2018 at 8 o'clock in the morning. Featuring one of the LARGEST pools in the Los Angeles metropolis, this 150-meter pool is almost just as big as a football field complete with a sand perimeter and an awesome water slide! The 5k course is a fun yet challenging route comprising mostly of packed dirt and small hills. Our team has carefully measured, insured and marked the route to ensure everyones safety! Aid and water are available on-course, as well as the scenic landscape that envelopes the family-friendly aquatic center. Participants start and finish on the sand just right beside the Hansen Dam Pool so be sure to bring your swimming trunks / bathing suit! "Support Solutions is a nonprofit organization committed to bringing services to our homeless neighbors. We create compassionate connections by providing for basic physical needs, and we use those relationships to engage people in programs which help them transition back into housing." The course is mostly packed dirt with some hills. It is an intermediate course but also one that anyone could PR on, but we believe that this will be a lot of fun for runners of all levels! Prizes await the top male and female winners! Upon arrival to the re-creation center, follow signs to the AQUATIC CENTER. Make your way to the giant pool and from there it should be pretty easy to see the start line. Parking is available and plentiful, just follow signs to the aqutic center. There is no fee to park. Come in your running attire and bring a change of clothes for the pool after, or better yet, run in your swimming attire! Sunblock, a hat and sunglasses are recommended but not required. *Please be advised, this is a FAMILY venue so dont bring any drugs and / or alcohol. Violators will be prosecuted to the fullest extent of the law.